Veterans Day once was a major holiday, with celebratory parades across America and gatherings in countless communities, ranging from the smallest towns to the largest cities. Some might say it isn't so much observed in the same manner today, easily mistaken as a sales day in stores for everyone to get a jumpstart on the Christmas holiday. The holiday wasn't known as "Veterans Day" until November of 1954, the first Veterans Day prior to my birth. In that context, that doesn't seem that long ago, at least to me. After all, many of today's Drum Corps International units have been around longer than that. Earlier, the holiday was known as Armistice Day, remembering the end of World War I, the "War to End All Wars." The German signing of the Armistice treaty famously occurred at the 11th hour of the 11th day of the 11th month in 1918. Fans more than likely have at least heard mention of the military heritage of early drum and bugle corps. Originally, veterans formed impromptu drum corps after World War I as a way to celebrate patriotism. They were readily seen parading down "Anytown USA," often with rudimentary drums and no-valve bugles. Over the course of many years, these groups developed into competitive units. Many were formed with the support of American Legion and/or Veterans of Foreign Wars posts. 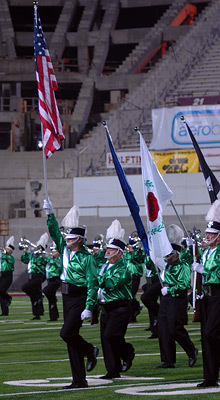 Associated with those leagues' competitions, at one time every corps performance included a presentation of the national colors. Those who saw the reaction to the Cavaliers Anniversary Corps parading the American flag down the 50-yard line at this past summer's World Championships, experienced first-hand the power of this simple act that is rarely—if ever—seen as part of competitive performances anymore. There are still some drum corps directly associated with the military like the units at the Air Force and Naval Academies which contribute to the daily life and regimentation of the institutions. And each August, drum corps fans are treated to the famed United States Marine Drum and Bugle Corps that always reserves a place on its calendar to perform as part of DCI World Championship festivities. its familiar 'West Point' look. Some of the early military-inspired traditions still live on within the ranks of Drum Corps International corps. 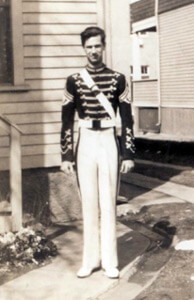 The uniform design of the Cadets, for instance, is fashioned after what is now referred to by many as the "West Point" military style. While marching, corps members still "dress and cover," but the meaning has been diluted over time. We still see rifles on the field in the color guard section, but such equipment is purely a visual device devoid of protecting the national colors, as rifles once did. Vibrant multifaceted flags are now for color and visual effects, not troop identification. Still with those roots in military tradition, the drum corps activity has morphed into a wonderful and exciting musical and visual feast. Things change, and the drum corps activity, like the rest of the world, continues to evolve. Many miss what they remember as drum corps to be like "back in the day," while many others look forward to what drum corps might become. One thing that hasn't changed: While we're enjoying whatever it is we like about the drum corps experience either as a marching member or a fan in the stands, there are others, off in parts of the world we might never want to visit, risking their lives so that we can continue to live free to do what we want and enjoy what we want. This past August in Bloomington at the World Championships, we argued with one another about who deserved the Open and World Class titles, relishing the intense volume of the loudest horn hits and the rhythmic volley of the drums. Half a world away; many serving in the United States Armed Forces found themselves in more sobering situations at that same time, loud explosions in too-close-for-comfort earshot while fending off volleys of munitions. Not seeing our favorite corps win or gain a spot in the World Championship Finals competition pales in comparison. Our veterans must always be honored and cherished for helping us live our lives in a way that we don't HAVE to think about our freedoms every day. And that's precisely why we should. One way we as drum corps fans can thank our veterans in some small fashion is to contribute to Bugles Across America (BAA), a most remarkable organization that remembers veterans when they pass on by supplying buglers free of charge to play "Taps" at funerals. 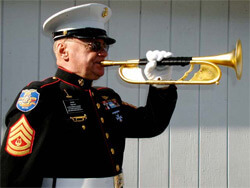 Since Congress passed legislation in 2000 guaranteeing U.S. veterans a flag ceremony and playing of "Taps" at their services, due to a lack of available buglers, the military estimates they can supply only 20 percent of the necessary buglers for military funerals. As a result, the piece is often played from a recording over an electronic system. Just last week, I had my first direct encounter with a digital bugle that played "Taps" while I was at the funeral of a veteran relative. The member of the honor detail at the gravesite pressed a button and a tinny, artificial-sounding rendition of the piece was generated out of the fake bugle's bell. bugle by instrument manufacturer Monette.